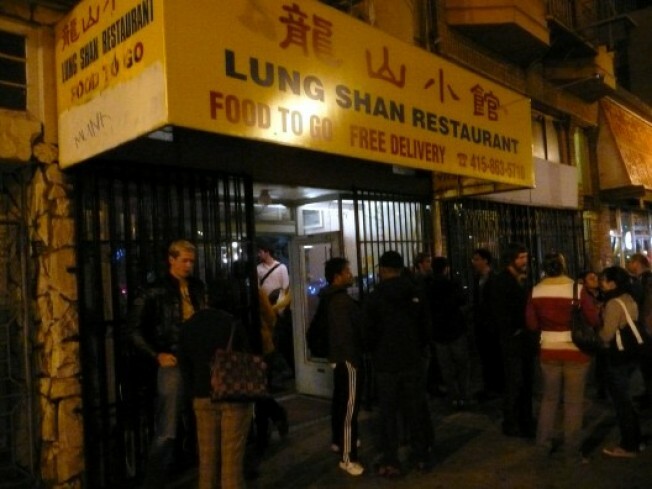 The Mission: Last night, the Mission Street Food gang took the show indoors from the antojitos truck to Lung Shan Restaurant. The blogs are alreadyveryabuzz about the evening's festivities, so we'll keep this short and sweet. Anthony Myint's four-item menu was excellent, as expected. As you can see, the crowds, and waits, followed the show to its new digs, though the timing-wise, it was an improvement over the truck lines (and we're guessing, will continue to improve). Aside from the food, as one Twitteree was quick to point out, the best thing about MSF might be the sense of a developing community, which along with booze, helps offset the long waits; local chefs were spotted, familiar faces were recognized. And regarding the setting, we will say that Lung Shan—which is straight out a David Lynch film, by the way—definitely upheld the feeling of capturing the essence of the Mission, from the Christmas lights to the portraits of frolicking horsies. A different essence from the antojitos truck, perhaps, but the Mission nonetheless.